NuFone Answering Service began providing telephone answering services to businesses and medical offices in the Chicago area. 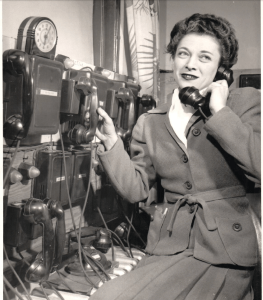 Our founder, Ruth Strauss, had several phones sitting on a table and would walk around the room to each of the phones as it rang, taking messages to be passed onto the respective doctor. Pat Steele begins working with Ruth, using switchboards to connect calls. After years of working together, Ruth puts it in her will that Pat and her sister Evelyn will have the first option to buy the company upon her retirement. NuFone moves from Madison, IL to the building in Oak Park where we currently office. Phone companies stopped providing the technology required to support switchboards, thus the transition to dial-phones is completed. Our current leader, Beth Davies, begins working at NuFone. Pat unfortunately passed away, handing the business down to her daughter, Beth Davies. Today, NuFone is still in the same building we moved into in 1960, letting our history of happy clients lead the way to providing exceptional service to our telephone answering service clients!